Ambrose Kyte, a wealthy Irish merchant, made an anonymous offer of £1,000 for exploration if it was matched by £2,000 of public subscription. 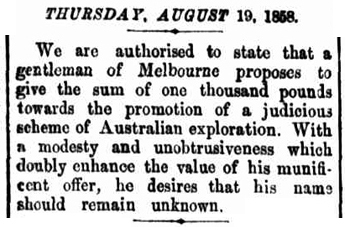 Sir William Stawell, Chief Justice of Victoria, announced the offer in the Argus on Thursday 19 August 1858. A public meeting was held at the Mechanics Institute on Collins Street, on Friday 31 August 1858. Thursday, 30 August 1858. Page 8. This meeting was poorly attended with around 50 people showing an interest in exploration. It was decided to set up an Exploration Fund Raising Committee to secure the £2,000. The Committee released a circular explaining the need to raise funds. Although it was a public meeting and supposedly separate to the transactions of the Philosophical Institute of Victoria and their Exploration Committee, all members of the Exploration Fund Raising Committee were members of the Philosophical Institute and all except James Smith were also members of the Institute's Exploration Committee. The only members of the Committee that gave to the fund were Wilkie, Mueller, Smith and Elliott [elected later], who contributed £25 between them. present the position of the Institute in relation to Australian exploration. This proposal was detailed in the Third Report of the Exploration Committee of the Philosophical Institute of Victoria which was read and adopted at a meeting on Sunday 26 September 1858. By the Monday 5 September 1859, £2,199 had been raised, enough to secure Kyte's offer. The Exploration Committee applied to Stawell for the £1,000 from the anonymous donor and a cheque was sent to the Committee on 19 October 1859. On 9 January 1860 at a meeting of the Institute, the Fourth Report of the Exploration Committee of the Philosophical Institute of Victoria was read when it was announced the required funds had been raised and the Government was asked for £6,000. On the Monday 23 January 1860, a public meeting was held at the Mechanics Institute, Collins-street, when the Special Report of the Exploration Committee of the Philosophical Institute of Victoria was read out. Because the funds had been raised, the Fund Raising Committee was dissolved and most of its members were re-incorporated into the Exploration Committe. Now in its third incarnation it comprised of 17 members.